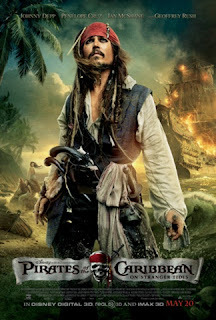 Snippets of Jack: "Thank you, Captain Sparrow"
Feeling in the Thanksigiving mood still, I'd like you to all know that I am so thankful for the awesome Pirates of the Caribbean series. Whosever idea it was to transform the intense ride into four epic movies deserves a round of aplause! All four movies are great, but I must admit that some of them I like more than others. So here's my listing on which are my favorites. Please comment and let us know if you agree or disagree and what your preferences are! While this movie was the only one so far I was able to see in theatres (went opening day! ), I don't think it quite surpassed any of the movies in the trilogy before it. While I liked Angelica's pessimistic mood and the strange love going on between her and Jack, I wished they had brought back some of the old characters. 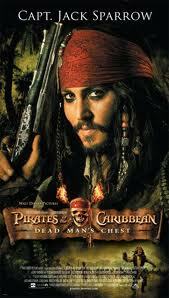 For example, I missed Jack's crew, like the good old silly pirates that we love to post about. Also, I wasn't really a big fan of Philip and Syrena. If they wanted to have a complicated love story a long with Jack and Angelica's, then they should have stuck with Will and Elizabeth. I'm wondering how they are handeling their long distance relationship. That being said, I did like the super creepy mermaids. I mean, what could be better than deceiving maniupulative yet beautiful sea creatures who drown and eat men? Not much. They were quite the obstacle to face and I loved watching them do so. 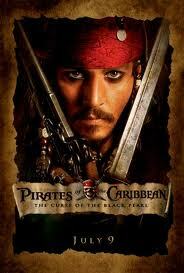 Oh, and Blackbeard and his Sword of Triton was pretty epic. It takes a lot to get through all that, but of course Jack and Barbossa mange it. So, it's not that I don't like the movie, It's just not my favorite. I feel bad listing the movies, becasue I like them so much. But some must rise above the others. Dead Man's Chest is a pretty dark and evil movie. It starts out with a rained out and ruined wedding, and ends witht the couple falling apart of the death of a hero. The second scene opens with the wicked torturing of sailors at a Turkish prison. The super sad aroma is about the only critisism I can make though. I love the scene when the crew ends up on the island of the Pelogostals. The scene with the stupid sailors who are being tricked by Elizabeth always makes me laugh. Not to mention I love the additon of Tia Dalma, the crazy Obeah woman. She's one of my favorite characters of the movie and she really freaks out Pintel and Ragetti. Davy Jones and Lord Cutler Beckett both become enemies to the pirates, both being equally as evil and scary. Of course, both in their own way. Jones has a bunch of creepy tentacles coming off his face and a beating heart in a chest, but Beckett is about four feet tall with a deathly glare. Two antagonists in one movie so epic! This movie is just so cool. Of course, it starts out kinda dark again with Lord Cutler Beckett executing a bunch of innocent people in Port Royal, probably Will and Elizabeth's neighbors, including a poor little boy. But this boy starts singing and then everyone else continues singing, "Hoist the Colors", the pirate anthem. And someone goes over and tells Beckett about all the singing, and all Beckett says is: "Finally." Yeah, I wasn't really sure why he was waiting for his prisoners to sing, but I later found out that when "Hoist the Colors" begins to be sung, it means that the Brethren Court is going to meet. This meeting is the premesis of the whole movie, which is kinda what makes it so awesome. All the pirates in the world joining together against two equally menacingly creepy vilians. Um, whoah there. This is just too awesome. 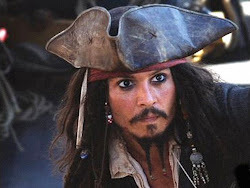 But first you have the hillarious scene between all the bickering pirates before you get to all the fighting. And in the midst of all the action you even get a little bit of romance. I'm serious, this movie has it all. The first movie ever really was my favorite. It got the ball moving for all the next movies. It's when you're first introduced to all the characters, and all the locations, including Tortuga! It starts off with little Will and Elizabeth, when they first meet. Elizabeth is sailing across the Atlantic when she catches a glimpse at the Black Pearl sailing away after destroying a ship. One person was able to survive this raid: William Turner Jr. Elizabeth takes care of him after he is rescued until they reach Port Royal. Elizabeth finds a medallion on him while he is unconscious, and keeps it from him. This little peace of gold is the main object of the whole movie. 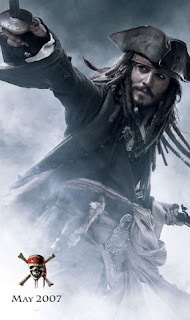 To be honest, I think all the characters were the best in this movie: Jack was the funniest, Will and Elizabeth were the cutest, and Barbossa was a great villain. The fact that Jack was always switching sides added to the awesomeness of the movie because the audience was never sure what was going through his mind. Then again, we can never be sure, but we love Jack all the same!